BANGKOK,(NNT) – HM King Maha Vajiralongkorn Bodindradebayavarangkun has graciously granted relief aid to residents of Nakhon Sawan, who had earlier been affected by severe flooding. 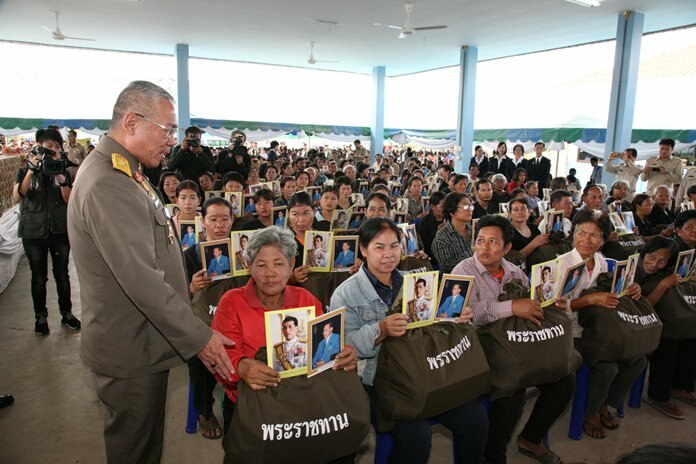 The Tambon Bang Phra Luang Administrative Organization in Nakhon Sawan Province, on Saturday welcomed the arrival of Maj. Gen. Suriyon Chiangtawan, who HM the King has designated to represent the Ratprachanukhro Foundation in the delivery of royally-bestowed relief bags and necessities to flood victims. Residents of Tambon Bang Phra Luang were among 25,248 households in Nakhon Sawan, who were hit hard by severe flooding on May 7th of this year. The floods hit 11 districts and damaged 325,000 rai of farmland, according to Nakhon Sawan Governor Thanakhom Jongjira. He said that the situation in some flood-hit districts has already returned to normal while some low-lying farmland remains inundated. In addition HM the King has instructed a mobile kitchen to provide meals to all, who have arrived to receive the royally-bestowed relief aid.